Automation advocates in Oregon display key grade-control concepts and demo equipment as they prepare the industry for standardized practices. Automated grade control has come a long way in terms of technological advancement in recent years. A critical element in the successful implementation of this type of automation as a standard practice is the human element, though. That’s why the Oregon Department of Transportation’s (ODOT) geometronics unit recently conducted a “Design to Dozer” computer-controlled heavy equipment demonstration for about 250 ODOT personnel; contractors; officials for the city, county, and federal governments; surveyors; and consultants near Eugene, Oregon. 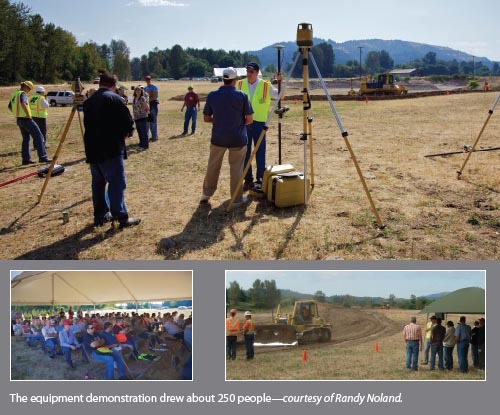 Several companies donated equipment, time, and expertise to the two-day event, including the PPI Group, a construction and surveying technology provider with locations in Portland, Oregon, and Seattle; Topcon Positioning Systems; SiTech NorCal, a Hayward, California-based construction technology dealer; construction and engineering software provider Bentley Systems; and local contractors K&E Excavating, Pacific Excavation, and Wildish Construction Co.
A highlight of the event was the field demonstrations. The attendees were divided into several groups to see demonstrations narrated by experts at six different stations. They witnessed the construction of the roadway subgrade and base rock using stakeless machine control systems such as Topcon Positioning Systems’ Z63 3D-MC2 GPS+ system, which was installed on a Caterpillar 140H motor grader operated by Pacific Excavation. At this station, Bill Painter, regional sales manager for Topcon, and Edwin “Shorty” Schuldt, machine control application specialist for the PPI Group, gave attendees an overview of how high-speed machine-control systems work and why contractors can significantly increase their productivity. Machine-control systems are increasingly growing in modularity, he added. Painter pointed out that all major construction-machine manufacturers are equipping their machines with valves so that dealers such as the PPI Group can get a motor grader up and running with machine control in about six hours, compared with the day and a half it used to take. a conventional GNSS antenna mounted on the dozer blade. The MC2 sensor combines a gyro, compass, and inertial sensor to measure the X, Y, and Z position as well as the roll, pitch, yaw, and acceleration of the dozer. The technology gives the system the capability to provide blade position readings up to 100 times per second—or roughly five times as many as conventional GNSS. Shersty pointed out the fact that the operator and grade checker verified the dozer’s position using control points and were off and running without the need for stakes. He asked the audience how much they thought it cost to get a stake in the ground, surmising that $50 sounded about right. On a road stretching less than half a mile like the one on the site, Shersty estimated that about 400 to 500 stakes would be needed under conventional grading practices. The cost savings that machine control would generate in such a scenario is $20,000–$25,000, Shersty noted. A little down the way, K&E Excavating discussed its construction of a bioswale using a Caterpillar 300 excavator equipped with a grade-control system provided by SiTech NorCal. Another station, dubbed “the Technology Site,” featured a Komatsu 220 excavator equipped with a Topcon X63 grade-control system and, mounted on a passenger car, Topcon’s new IP-S2, which combines GNSS, an IMU for tracking vehicle attitude (pose), and external wheel encoders that capture odometry data from the vehicle, 360-degree digital imaging, and laser scanners. The IP-S2 can be used to capture position coordinates, lidar data, and video footage that transportation officials can use to monitor comprehensive roadway assets and structural features for maintenance purposes. Singh opened the event by advocating the widespread use of automated grade control—which he described as a disruptive technology, one that forces the industry to change its processes. To date, he said, ODOT has traditionally used a “reactive, project-centric” approach to managing its engineering data. In this paradigm, all survey and design data are created for a specific project but not used beyond construction. As-built construction plans are developed when a project is completed, and the site is re-surveyed when a change is required at a later date. Singh argued that care must be taken to ensure accuracy while automated grade control systems are in use. In his experience, he said, when things go wrong with automated grade control, the design (i.e., formatting problems) usually is the cause. Also, the use of automated grade control systems is affecting many different professionals on a project. Engineers will begin to provide coordinate-correct 3D designs based on buildable files, not just designs from which bids are developed. Surveyors will always have a key role but will be responsible for providing control points and managing data, says Singh. Inspectors will need to get used to working with positioning data, but will get less support from surveyors than in the past, and increasingly they will need specialized positioning-oriented tools to do their jobs. Tom Metcalf, PE, lead engineer on the nearby I-5 Williamette Bridge project for OBEC Consulting Engineers of Eugene, presented “3D Design for Machine Control Grading.” The project involved 2,500 feet of roadway work, twin 1,900-foot bridges, and 2,300 feet of roadway and ramp reconstruction. On one side, the I-5 roadway actually had to be raised several feet, and staging posed challenges. Metcalf noted that the grading contractor, K&E Excavating, asked to use machine control on the alternative delivery project to keep material quantities accurate and to reduce costs. So OBEC used InRoads XM software to generate digital terrain models (DTMs) for K&E’s machine-control systems. This was a case of adhering to a new industry standard of accuracy needed for automated grade control that entails more design time in order to reduce field modifications, in contrast to the old industry standard of “close enough modeling” with allowances for field personnel to fill design gaps in the field, according to Metcalf. Structures requiring finer detail or incorporation into designs include guardrail benches, side slope transitions, structure section transitions, and drainage features. Carlsen welcomed implementation of the automation plan. “I think that when it comes fully to fruition, it’s going to help in a lot of ways,” he said. “First of all, from an estimating standpoint, we’ll have electronic data to bid off of; we won’t have to recreate it off of the paper drawing. We’re hoping that we’ll get to the point where the electronic design can be transitioned fairly seamlessly to what we need, which is 3D models that plug into our Topcon machine control and our GPS ground control without having to go through several steps that we have to go through now to get it there. *Event Materials Available Online: Design to Dozer presentations and a draft of the ODOT six-year plan. Don Talend of Write Results Inc., West Dundee, Ill., is a print and e-content developer specializing in covering technology and innovation.